During the late 1950s and early 1960s, Marvel Comics writer/editor Stan Lee and artist Jack Kirby collaborated on a number of monsters with silly names. But when the success of the Fantastic Four got their attention, they dropped the monster routine and began reviving the long-dormant superhero genre in what has been dubbed "the Silver Age of Comics." The early '60s saw Lee and Kirby (or Lee and Steve Ditko) churn out dozens of superheroes that are now regarded as classics, from the Avengers to the X-Men. But in May 1962, Lee and Kirby collaborated on one final monster that seamlessly bridged the gap from monster to superhero: the Incredible Hulk. A version of Dr. Jekyll & Mr. Hyde with a dash of Frankenstein's Monster and a comic book spin, Hulk's sales weren't exactly huge. Marvel actually cancelled his comic after six issues in order to clear out some space on the publishing schedule, but after Lee and Kirby discovered that the Hulk had gained popularity among college students, they kept him alive via guest appearances in other comics along with making him a charter member of the Avengers. Hulk soon found himself as a major supporting character in Marvel's long-running "Tales To Astonish," during which Hulk's popularity soon grew so large, Marvel renamed "Tales To Astonish" to the more relevant "The Incredible Hulk." The character went on to inspire the popular live action '70s television show and TV-movies starring Bill Bixby and Lou Ferrigno, and can even say he had a hand in giving Hulk Hogan his stage name. 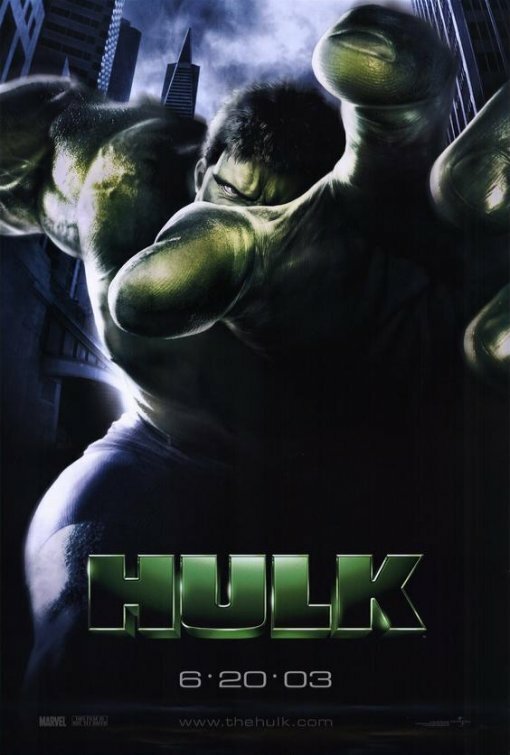 After the Bixby/Ferrigno show and movies, several cartoons, a handful of video games, various toy lines, all kinds of memorabilia, and even his own roller coaster at Universal Studios Florida, the Hulk finally got his own feature-length theatrical movie in the summer of 2003. Is the movie befitting of the Hulk's status as a pop culture icon, or is it in dire need of a little "Hulk Smash"? Our story begins at a military base in the California desert circa 1966, where we are introduced to a scientist named David Banner (Paul Kersey). Attempting to instill stronger immune systems and regenerative abilities in his test subjects, he moves from aquatic life to lizards to monkeys, finding progress but no real success. He goes to his superior, General Thaddius "Thunderbolt" Ross (Todd Tesen), and asks for permission to begin testing on human subjects. Ross denies him, and David decides to use himself as a subject instead. Soon thereafter, his wife Edith (Cara Buono) gives birth to a son, Bruce. David wonders if his experiments have had any effect on Bruce, while his wife is blissfully unaware of what he's done. Four years pass, and General Ross finally discovers David's work on humans. He throws David off the project, prompting David to wreck his lab and trigger the self-destruct system on his equipment. Edith huddles under a table with her son, but the returning David drags her into a bedroom, slamming the door behind them. Young Bruce plays with his stuffed dinosaur, staring at the bedroom door as the voices of his parents rise. The door swings open and we cut to black. We flash forward to the present day. A brilliant scientist working at UC-Berkeley's biotechnology center, the now-adult Bruce Banner (Eric Bana) has repressed much of his early childhood while being raised by adoptive parents. With the help of his on-again/off-again girlfriend Betty Ross (Jennifer Connelly) and funding from the local military-industrial complex, Bruce is working with nanobots and gamma radiation to regenerate living tissue. Unfortunately, all Bruce and Betty are able to accomplish is an expensive way to make frogs explode. They could save a lot of money and time by just wrapping the frogs in a roll of tinfoil and throwing them a microwave, but I guess spending government money to do it with far-out technology is more fun. Enter Glenn Talbot (Josh Lucas), an executive with ties to Betty's father, the aforementioned General Ross (now played by Sam Elliott). Talbot runs a defense corporation and is quite interested in Bruce and Betty's research, making it clear that if he can't hire them away, he'll acquire their technology by some other means. Man, if I knew blowing up frogs was such big business, I'd have been doing that long ago. Anyway, Bruce and Betty's assistant Harper (Kevin Rankin) makes adjustments on a gamma radiation generator inside a sealed chamber in preparation for an experiment. Harper ends up running into some trouble, and Bruce enters the chamber to help just as Harper crosses some wires and sets the generator into motion. Bruce orders Harper to get out of the chamber, but he's too scared to move, cowering directly in the path of the generator. Bruce jumps in front of Harper as the generator fires, taking a full dose of gamma radiation. Bruce wakes up in the hospital a few days later, amazingly in perfect health. Betty can't figure out why he's still alive, but Bruce doesn't seem too fazed. What he doesn't realize is that the radiation has awakened something deep inside of him, the existence of which he could have never foreseen One night, Bruce wakes up to see a man with three dogs sitting in his hospital room. Bruce recognizes the man as the lab's creepy new janitor, who reveals himself to be none other than David Banner (now played by Nick Nolte). David tells Bruce who he is and reveals that he's been in military custody for the last thirty years, but Bruce refuses to believe him. Bruce believes his parents had died, so the janitor can't be his father. You know, it doesn't quite have the same effect as it did in The Empire Strikes Back, but what can you do? Bruce soon finds himself having terrible nightmares over the next few days, flashbacks to an incident at his childhood home. He goes to the lab one night to do some work on the project, when he has another flashback. Bruce realizes that David was telling his truth, and combined with the stressful past few days, it is enough to bring out what was buried inside him. He transforms into what we know as the Incredible Hulk, a gigantic green-skinned brute that goes on an absolute rampage and tears the entire lab to shreds. He rips the gamma radiation generator in half and throws it through the side of the building, where it crushes a police car responding to the ruckus. As he starts to calm down, the Hulk turns and sees a fascinated David watching, peeking from behind a door. David cautiously touches the Hulk's face, whispering, "My Bruce." The Hulk, enraged, jumps through the roof and runs away. Bruce wakes up the next day, and tells Betty about a very vivid dream he'd had the night before. When Betty asks if he was at the laboratory the night before, he says no, believing that his destruction of the place was a dream. Meanwhile, news of the incident has reached General Ross, who accompanies a team of soldiers to Bruce's house. He orders Betty to leave, then gruffly interrogates Bruce about what happened. Turns out they found Bruce's watch at the lab, and they think he had something to do with it. When Bruce claims innocence, Ross tells Bruce that he had his father locked away and won't hesitate to do it to Bruce if he doesn't cooperate. He asks Bruce about the incident we saw earlier, and Bruce says he doesn't remember a thing about it. General Ross is convinced that Bruce is just as messed up in the head as his father, so he puts him under house arrest, with military-type guys guarding the house from across the street. He also orders Bruce to stay away from Betsy, or else. Bruce gets a call from his father that night, who reveals that he's performed a very interesting experiment on his three dogs, and has sent them after Betty. As Bruce begins to leave, an angry Talbot arrives and forces his way past the guards. Upset over the destruction of the laboratory, he starts throwing Bruce around. Bruce gets angry and hulks up, throwing Talbot (and his couch) through the front wall. He takes out the guards like it's no big deal, then leaps into the air on his way to Betty's cabin in the woods. At the cabin, Betty investigates a strange noise that she discovers is the Hulk. Frightened at first, she quickly realizes who he is just as David's Hulk-ified dogs arrive. He places Betty into her car, and the trio of dogs attack. A huge brawl ensues in the forest surrounding Betty's cabin, with the Hulk eventually killing the dogs. He sees his reflection in a puddle, and realizing that he's probably scaring Betty, he calms him down long enough to turn back into Bruce Banner. Betty helps him into the cabin, where he deduces that the gamma radiation triggered something in his DNA that made him the Hulk. Betty asks if he can remember anything, and he just said it felt like a dream in which he was free. Desperate to get Bruce some help, Betty calls her father the following morning and tells them where they are. Bruce wakes up and steps out on the cabin porch, only to get shot with a tranquilizer dart as General Ross's men move in. He's taken to a high-tech underground military facility and put under surveillance. Betty wants him released, Talbot and General Ross debate on whether he should be killed or cultivated, and David wants something more. About that same time, David visits the laboratory that the Hulk smashed, putting what's left of the gamma radiation generator back together. He fires it on himself, after which he discovers that he can intermingle with (and assume the properties of) anything he touches. Our narrative leads us from the California desert to San Francisco to another military base, where we learn what happened on that fateful day in the film's prologue and David's true intentions: to use Bruce's power to get revenge on the military that tried to throw a wet blanket on his scientific ambitions. Like the comic book that inspired it, the movie owes more to Dr. Jekyll & Mr. Hyde and Frankenstein than its cinematic brethren (Spider-Man, X-Men, et al). There's even overtones of King Kong and Beauty And The Beast. The movie tries to give us a deeper tone, but packages it into a palpable summer action blockbuster. I don't know if one could classify it as a blockbuster because of its financial disappointment (experiencing a seventy percent drop in its box office numbers in its second week of release, the second largest drop ever recorded for a movie that topped the box office charts in its opening weekend), but the thought was there. The script by John Turman, Michael France, James Schamus isn't too bad at all, though I guess they decided to save some time and combine two villains. Hulk doesn't have any archenemies that the casual fan would recognize, so they simply combined elements of the Absorbing Man and Zzzax into one brand-new villain. It makes sense to me, since I can't think of one Hulk villain at all. I actually hadn't heard of the Absorbing Man and Zzzax until I started doing research for this review. The duality of Bruce Banner and the Hulk that Turman, France, and Schamus add to the script is intriguing. Bruce is an insignificant wimp, repressing his rage and anger under a façade of just being a simple geek. However, when you uncork that bottled-up rage, he's transformed into a big green earthquake on two legs. We the viewer are able to project a little bit of ourselves onto the Hulk; all of us have just wanted to snap at least once, but won't or can't. Whether it's because of an inferiority complex or simply not wanting to make a scene, we've all been there. The Freudian nature of the character's dual personality is actually handled well in the movie, a handling that is enhanced by the acting of Eric Bana. An Australian standup comedian with only one earlier American movie on his résumé (Black Hawk Down, for all you trivia fans), Bana brings a certain charm to the role that makes you want to like him, yet want to avoid making him mad. I also really liked Jennifer Connelly as Betty Ross. She gives off a warm, soothing vibe that the character so desperately needed for the Beauty And The Beast aspect to be believable, and Connelly is just so charismatic that you can't help but like her. I also thought Sam Elliott and Nick Nolte did commendable jobs as well, with a special thumbs-up for Nolte's performance during his anti-military rant at the end of the movie. Good stuff, the cast is. I liked director Ang Lee's rather novel approach to framing and scene transitions, along with the occasional paneling to show the action from multiple angles. That kind of filmmaking really gave the movie a charming comic-y look, quite a stretch from his prior work on Crouching Tiger, Hidden Dragon. Lee also makes frequent use of the color green, ranging from subtle uses (like the set design, green murky water in a mop bucket, characters with green eyes) to a simple green tint in some scenes. It starts out subtle, but as the movie progresses, it feels like they're trying to beat the viewer over the head with it. Okay, so the Hulk is green! I get it! They didn't have to put that color all over the movie. Daredevil and Elektra wear red, and you didn't see people sticking red all over their movies. But the movie has an enjoyable sci-fi B-movie energy, which I thought was helped by Danny Elfman's engaging score. His music adds to the sci-fi ambience, while hearkening back to Bernard Hermann's work with Alfred Hitchcock at the same time. My only real worries with the movie are with the CGI and the movie's darkness. The CGI gets a lot of crap from a lot of critics, but is it really that bad? I actually thought the CGI looked adequate, but my main complaint is that it just doesn't look like it could exist in real life. It's like the animated characters from Who Framed Roger Rabbit, where it looks really good, but you just don't believe it's a real person. I'm just not convinced that the Hulk was really there. If the whole movie had been animated, I wouldn't see a problem. I think I'll be able to live with the CGI Hulk, but I'm not sure about those Hulk-Dogs. What's with those? While I understand and appreciate that they were included just to give Hulk something to fight in the second act, I didn't think they were pulled off all that well. Your mileage may vary, however. And I don't know if it's just me, but it seems like a few of the movie's action sequences were just too dark to decipher. I had to turn the brightness on my television all the way up to make out what was going on. Why would they have big action sequences if they were going to be hidden in shadows? What were the filmmakers trying to hide? The questionable CGI? The fact that the ending was totally nonsensical, even by comic book standards? It could be either or neither, but in any event, I didn't like all that darkness. I want to see what's happening in the movie, not listen to sound effects. If I wanted to use my imagination, I'd listen to old radio dramas. While almost everything about the movie is sound, my feelings regarding it are mixed. I enjoyed parts of it, but I felt that as a whole, the movie simply cruised along with the bare minimum of effort. It didn't leave me looking forward to a sequel, if that's what it was supposed to do. Perhaps the best things to come out of the movie are those ultra-cool Hulk Hands toys. I dare you to find me one person who doesn't enjoy Hulk Hands even a little. They're so nice, they had to make them twice (as evidenced by the "Thing Hands" that were made after Fantastic Four came out). I wasn't exactly disappointed in the movie, but I wasn't exactly all that enthused watching it either. But I think I'll be giving Hulk three and a half stars. Perfectly acceptable chaos, Hulk is.